This DC fan appreciates it! Having fun, although beat. Blog visiting and returning comments of 150 a day wears me out, but there are so many cool themes out there. Another DC fan! I found this Joker very creepy. My husband has a huge Joker poster that was hanging from the ceiling at Best Buy when the movie came out. I wont let him put it up..eek! I loved Ledgers Joker, but my favourite is Mark Hamill's on Batman the Animated Series. One of the all time best performances. He was amazing. Just read your G-J entries. Very informative, and I do a lot of comic book entries on my blog, so I appreciated the subject matter. Thanks for stopping by my blog, too! I liked the Joker, too - even on the old Batman T.V. show. Thanks for coming by - I think old is the new cool, too! Who doesn't love to hate the Joker??? What a character he was...is??? However, your "I" post is my grand kids favorite character. They LOVE Ironman. My 12 yr. old grand daughter got to "high five" Robert Downey Jr. at an award show she attending last week. She is in awe! Thank you for dropping by my blog. I hope both of our health issues will get better quickly. Ahh, the Joker. Loved Heath Ledger as the Joker. So sad we'll never get to see more of his work. Thanks for visiting my blog. I hope your ankle heals up quickly and there aren't any further complications. It truly stinks having to be off your feet and take everything slowly...it's maddening! love the Joker ...and thanks for visiting my blog- I think A-Z is a gas! Loved Heath Ledger's Joker. Really, really sad we lost him. Jokers laughing really is quite infectious. What a character, what a legend. Love the Joker. Thanks for visiting my blog. Hope you get better soon. One of the truly great villains. Ledger will be tough to beat. He did a great Joker! Can't erase that laugh or that face. 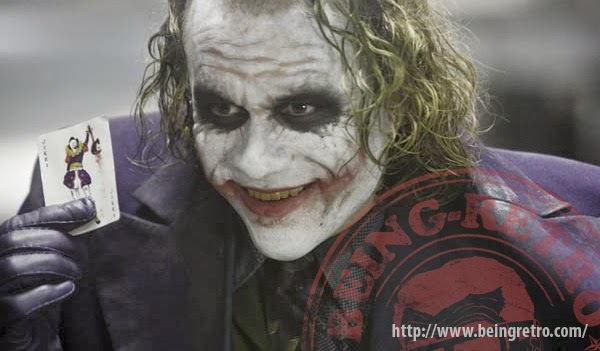 I thought Ledger's Joker a sad guy. But, I suppose that's why he was under all that paint. I'm definitely invested in the DC franchise. Marvel... not as much. I'm not a comic book fan but Heath Ledger was amazing as the Joker. As many have said before it was so sad to lose him, dude was a brilliant actor. Although, I may change my mind when Affleck does it.